From creative genius Tim Burton (“Alice in Wonderland,” The Nightmare Before Christmas”) comes “Frankenweenie,” a heartwarming tale about a boy and his dog. After unexpectedly losing his beloved dog Sparky, young Victor harnesses the power of science to bring his best friend back to life—with just a few minor adjustments. He tries to hide his home-sewn creation, but when Sparky gets out, Victor’s fellow students, teachers and the entire town all learn that getting a new “leash on life” can be monstrous. A stop-motion animated film, “Frankenweenie” will be filmed in black and white and rendered in 3D, which will elevate the classic style to a whole new experience. Over 200 puppets and sets were created for the film. The voice cast includes four actors who worked with Burton on previous films: Winona Ryder (“Beetlejuice,” “Edward Scissorhands”), Catherine O’Hara (“Beetlejuice,” “The Nightmare Before Christmas”), Martin Short (“Mars Attacks!”) and Martin Landau (“Ed Wood,” Sleepy Hollow”). 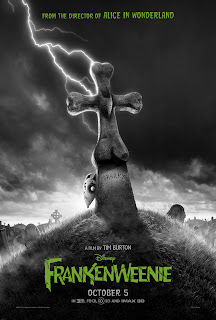 "Like" FRANKENWEENIE on Facebook to keep updated. In accordance to the FTC Guidelines and the WOMMA Code of Ethics, I am disclosing that no compensation was accepted for posting this update, I just dig TIm Burton movies. If Disney wanted to re-animate any of my pets, I would probably let them. All opinions are, as usual, strictly my own.